During the 1990’s with the Jubilee of 2000 in mind the Vatican commissioned 50 new churches to be built in areas of greater Rome where as many as 600,000 citizens were deemed to have no nearby church to attend. The last church to be completed has become the most notable for the innovations of its architect, Richard Meier. 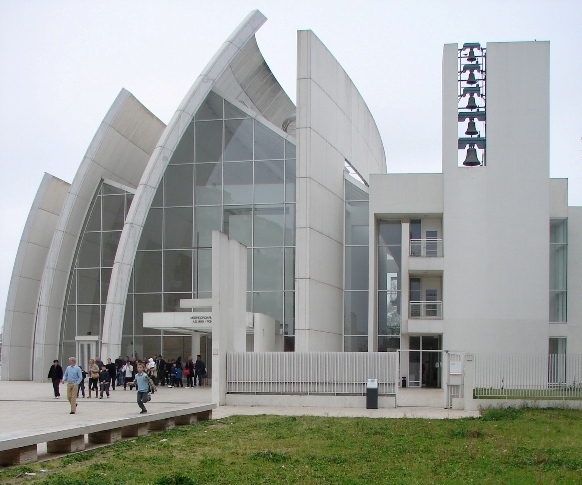 The church of Dio Padre Misericordioso (God the most merciful Father) – usually called the Jubilee Church – is built near the ring road southeast of Rome. In the rather featureless peripheral zone of Tor Tre Teste the ancient agricultural landscape has been awkwardly invaded by industrial zones and unattractive modern apartment blocks. The left side of the church (facing the entrance) is formed by the sections of three overlapping fragments of concentric spheres constructed from enormous tiles of white architectural concrete. 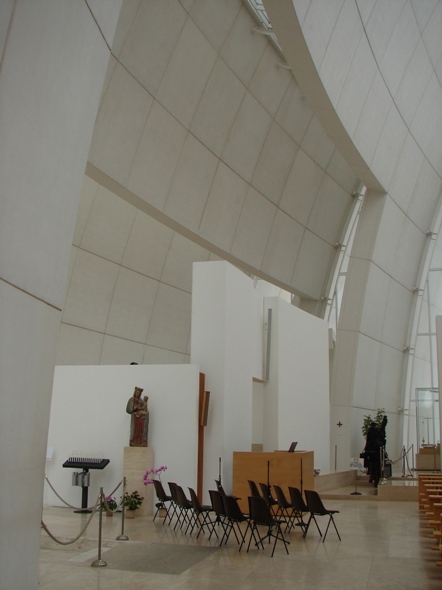 The right side of the nave is a straight vertical wall, faced with panels of wood slats, dividing the church itself from the office and classroom portion of the complex. Most people (I and my visiting friends among them) find the interior space very attractive, both simple and spare yet full of visual variety. The fundamental elements of sphere and cube are everywhere present, evoking the cosmic geometry of the Renaissance. Yet asymmetrical angles and cut-outs everywhere upset predictable patterns, deconstructing the classical forms in the architectural idioms of a postmodern culture. The soaring concave sections seem light and delicate – like sails (a word often found in descriptions) – yet massive enough to give mystery to how their dome-like arch can sustain itself without falling. All spaces between the shells and walls are glass-covered, allowing light to enter from all angles while avoiding strong direct sunlight. The unadorned whiteness of the interior, with pale wood pews and travertine marble pavement, creates a monastic feel. The only decorative elements beyond the architectural features themselves are a crucifix, a deep bas-relief carving behind the altar of God the Father leaning down in an attitude full of misericordia, and a medieval statue of the Madonna in the baptismal chapel tucked under the second shell. Surely those who visit the church as architectural tourists are likely to be frustrated by the real-time impossibility of extracting the sail-like structure from the blunt facts of its surroundings. But then again, Christianity is not gnostic, but incarnational. Its proper architecture (not confined to one style, to be sure) locates the faithful as people both called out of the world as pilgrims en route to a city not built by human hands, and yet called to stand as servants in the midst of those in need of spiritual and material nurture. We enter the church not to evade the rubbish bins of our life for a momentary uplift of mystical light. Our experience in the church of the “most merciful God the Father” should lead us to return to the apartment blocks of a suburban wasteland as agents of misericordia. But if the travertine-paved area surrounding the church was “conceived as an open piazza framed by grassy areas with benches and trees,” its present condition suggests a falling off of the good intention. The graffiti-defaced benches sit empty and the grassy area is a bed of weeds. A wall higher than what Meier may have intended now barricades the church complex from the very apartment blocks whose people are to be drawn into community in and by the church. The wall serves as backboard for the rubbish bins; the expansive pavement surrounding the church offered no invitation to settle there for conversation or quiet reflection. Fortunately I had made my visit to Jubilee Church not only as architectural tourist but as a worshipping guest at a Sunday morning Mass during Lent. The congregation of 150 at only one of several services represented about two-thirds of seating capacity and was composed of people of all ages, including families with young children. The liturgy was suffused with plenty of expressive piety and with genial socializing afterwards in the nave and the entryway. The mainly-youthful choir sang with gusto and the priest preached with evangelical fervor. If our first impression was one of wanting to lift the church out of its depressing environment, our departing desire was to clear away all the blockages that interfered with the church’s orienting presence at the fulcrum point of the neighborhood. Prof. John Skillen has taught courses in medieval and Renaissance culture at Gordon College (Massachusetts) for over 25 years. For the last decade he has served as the inaugural director of Gordon College's arts-oriented semester program in Orvieto, Italy, where he also directs the Studio for Art, Faith & History, sponsoring conferences, exhibitions, and theatre events that address the relevance of pre-modern European culture for our postmodern context.